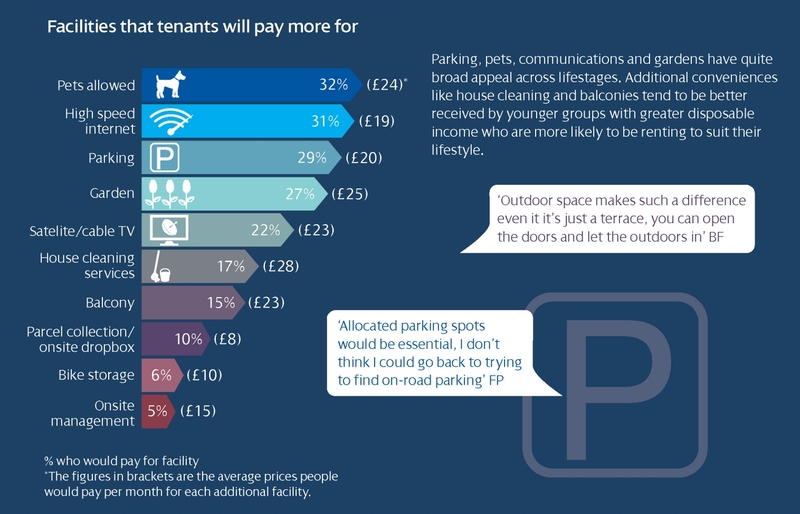 The PRSim Tenant Survey reveals that there are some facilities that tenants will pay a premium for. It seems that parking, pets, communications and gardens have quite broad appeal across lifestages. Whilst conveniences such as house cleaning and balconies tend to be better received by younger groups with greater disposable income who are more likely to be renting as a lifestyle choice. When we look at appeal by lifestage we find that the “Younger Independents” and pre-family “Flexible Professionals” are most receptive to paying for communal services. However, tailoring the service to the priorities of the individual can increase interest significantly, for example child centric facilities for “Budgeting Families” or communal garden space for “Reconciled Renters”.